Lockdown captures everything he tracks. Few of his targets have outmanoeuvred him, and even fewer have escaped his prisons. Now, the merciless bounty hunter has set his sights on the Autobots! 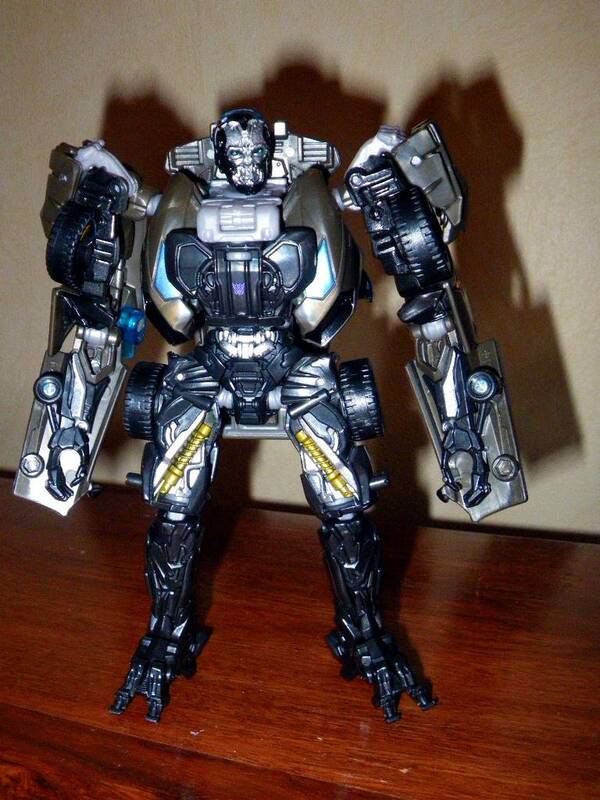 Lockdown is not a character I was particularly familiar with prior to Age of Extinction (AoE). To me, he was a tall lanky Decepticon character from Animated that had received several updated figures since. As I did not watch Animated, and didn’t care for the overly stylised toy aesthetic, I really knew little more. However, when it was revealed that he would be the main villain in Age of Extinction, I was very interested to see what they did with him – after all, some of the most iconic characters of the live action movies have been very distinct to the series, such as Blackout, the Twins (love ‘em or hate ‘em) and the very cool interpretation of Sentinel Prime. I also love that the live action films are playing with all of the different continuities Transformers has spawned over three decades, and creating an all new melting pot. Lockdown did not disappoint in the film – I thought he was easily the best villain the live action films have offered so far. With no allegiance other than to his employers (as a bounty hunter, as he is in Animated I believe), and a ruthless attitude towards attaining his goals, Lockdown brought a sustained threat to the entire film. Plus he was rather creepy and fought the much larger Optimus Prime at least as an equal. And he turns into a grey Lamborghini. Sadly, the more traditional toyline associated with AoE (Hasbro Generations / Takara Movie Advanced) lacks many villains, and Lockdown was released rather late on. Furthermore, in the UK the Generations line is exclusive to Argos (Leader Class) and Toys ‘R Us (the rest), so hard to come by. And finally, Hasbro have almost stopped painting their figures. So, I decided the best course of action was to import most of the AoE figures I wanted, and went with the Takara versions on the most-part, with more elaborate paint work. Sadly, despite being one of only two villains to receive Generations figures, and the main villain in the film, Lockdown has proven a disappointment – a casualty to oversimplification. In summary – Lockdown: awesome villain, mediocre toy. As already mentioned, in the film Lockdown transforms into a grey Lamborghini – a 2013 Lamborghini Aventador LP 700-4 to be precise. It’s a very cool, yet sinister alt mode. The toy replicate the car mode in great detail, although for some unfathomable reason is cast in metallic brown plastic. Still, it looks awesome and rolls well. Measuring 5” (12.5cm) in length, Lockdown is a little bit smaller in car mode than Dark of the Moon (DOTM) figures, which were themselves smaller than previous live action movie lines. This puts him at 1/37.6 scale. 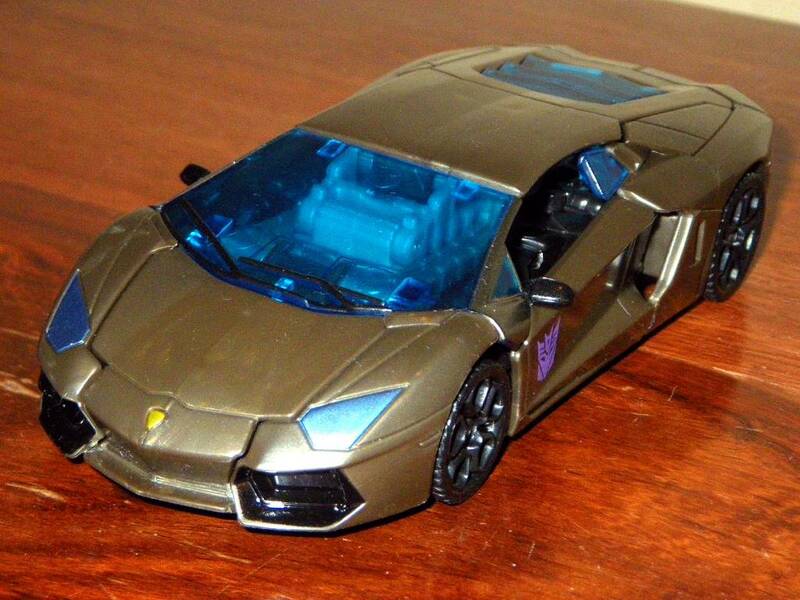 In addition to the brown bodywork, Lockdown has transparent blue plastic windows (with the exception of the doors which are missing windows), metallic blue headlights, red brake lights, gold Lamborghini emblem, black plastic wheels, and black painted vents, headlights and wiper blades. There is also a purple Decepticon insignia printed on the left side of the left side of the car (although given Lockdown is independent of factions, this is a bit weird). Lockdown’s face gun can be attached to the roof of the car, as this is a separate accessory with no storage in vehicle mode. It looks really daft here though. All-in-all Lockdown has a very nice car mode. Lockdown’s robot mode is totally out of proportion, and has limited articulation (11 points – although many are simple hinges or swivels making dynamic poses challenging to achieve). It would have been easy to find a way to fold the car wheels on his hips away, and to extend his legs and fold away his hands – indeed there’s actually lots of unused room within the car mode even if more space was needed for any of this. Measuring 5” (12.5cm) tall, he’s also a midget (he looks the hunchbacked beer-bellied DOTM Deluxe Leadfoot in the eyes). OK, negatives aside, let’s move on to positives. 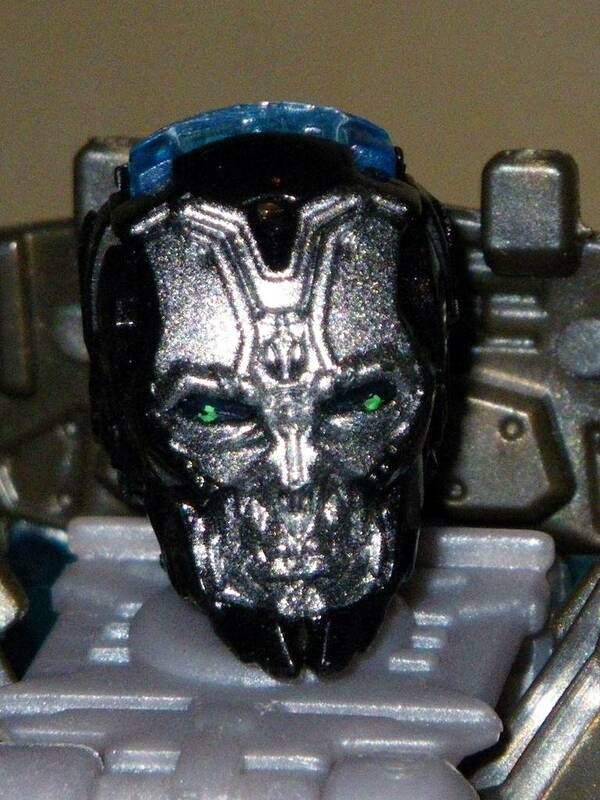 The most obvious is the amazing head sculpt – the detailing is phenomenal, and Takara have really brought this out with a black base, silver face, transparent blue mask visor (moulded folded away on top of his head – true, this should be green, but blue works fine) and perfectly painted green eyes. Next up is the fact that, unlike DOTM Deluxe Roadbuster, the top of the car folds away into a neat backpack, rather than hanging between his legs. Also, in fairness, the transformation is simple enough to be easy to play around with on your desk. I just wish there were a few more concessions to make Lockdown a bit more film accurate in proportion. 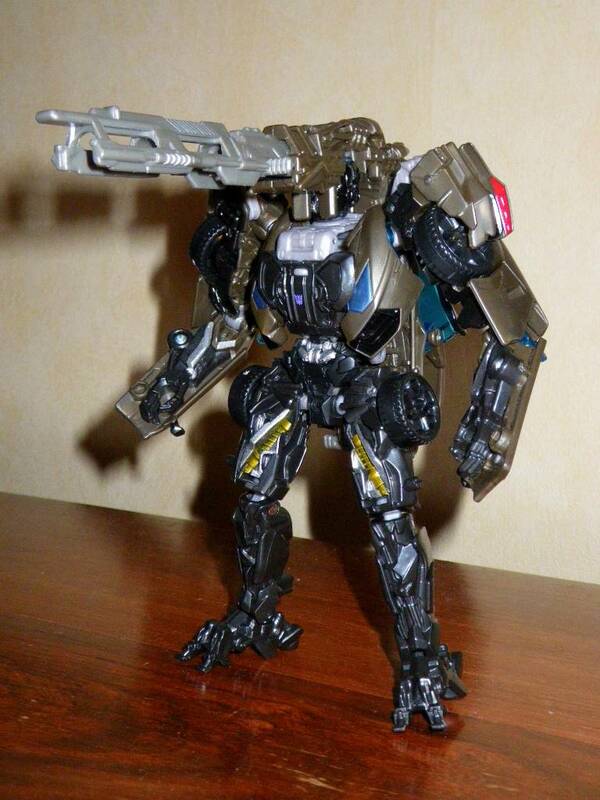 Of course, one of the iconic features of Lockdown is that his face turns into a gun in the film. While the toy does not do this, I doubt it would have been possible to incorporate the feature into so small a figure. However, Lockdown does come with an accessory that can be used as his gun face (although I find it a bit fiddly to attach here) – measuring 5 �” (13cm) in length, it’s pretty epic and looks awesome in place. Lockdown also manages to balance fine with this attached, which is a plus for display. I am a little concerned that the transparent blue plastic to which it attaches on his head is already showing stress marks after just three goes though, and I worry that it could scrape the green eyes or silver face a bit in time - in fact after four goes the silver has begun to scrape off. The gun can also be attached to his shoulder, or his arm (replicating the blade he uses to remove Ratchet’s spark). It can also fire a missile (using pressure) if you’re so inclined. Overall, the makings of a good robot mode are there – car parts end up in the right places, streamlined back kibble, phenomenal detailing and (in the Takara version) a great paintjob. Alas, the overly simplified transformation (just 13 steps proclaims the box – and I’d say that’s an exaggeration!) results in a poorly proportioned robot mode with limited articulation that could so easily have been improved with just a few minor adjustments. Transformation Design: 3 – The transformation model is a simplified version of DOTM Deluxe Roadbuster. While this does get all the vehicle mode parts in the right places for robot mode, the lack of character specific tweaks results in a poorly proportioned robot mode. However, it is at least easy to pick up and play with. Durability: 5 – The head is already showing stress marks from the gun attachment, and the gun also scrapes paint from the face. There are also few detachable joints, so there is a risk of permanent damage through stress. Fun: 6 – Lockdown is an awesome villain, which adds play value in itself. The gun face is also extremely cool, while the simple transformation does mean he’s easy to play with. These tip him above average. That said, he has a disappointing robot mode with poor articulation. Aesthetics: 5 – Lockdown has a great Lamborghini mode, and supremely detailed (and painted in the Takara version) robot mode. However, the robot mode proportions are terrible, and articulation limits poses. Articulation: 3 – Lockdown only has 11 points of articulation, most of which have a limited range of motion (being hinges). Dynamic poses are therefore difficult to achieve (particularly with simple hinges on his ankles). Value/Price: 3 – Lockdown is not the best Deluxe out there, even in the AoE line (so far I would give that to Crosshairs, but I’ve plenty more to play with as of 8th August 2014!). The Hasbro price point has risen, and lack paint, while importing the Takara version is expensive. However, if you have to import then go for the Takara version. If you bulk import like I did, it actually only costs shelf price anyway (�15 GBP or less). You’re not going to come away thinking you got good value here though. Overall: 4 – Lockdown is a disappointing figure, mainly because just minor adjustments would have made him awesome. Instead we’re left with a poorly proportioned robot mode with limited articulation. That said, he is the main villain, and an excellent character, in a line with only one other bad guy (incidentally, Voyager Galvatron is much better!) to pit against legions of Autobots and Dinobots so I figure most people will end up with him. Just make sure you don’t expect much.